Bowls of this pattern with a single register of lotus petals to the exterior bearing Xuande reign marks include one from the Collection of Mrs. Alfred Clark, exhibited in Blue and White Porcelain from the Collection of Mrs. Alfred Clark, Spink & Son, London, 1974, Catalogue no. 12. Cf. two bowls illustrated by A. Joseph, Ming Porcelains, London, 1971, pls. 30 and 31, the latter with two registers of petals on the exterior; and another from an important private collection, sold at Sotheby's Hong Kong, 17 May 1988, lot 24. 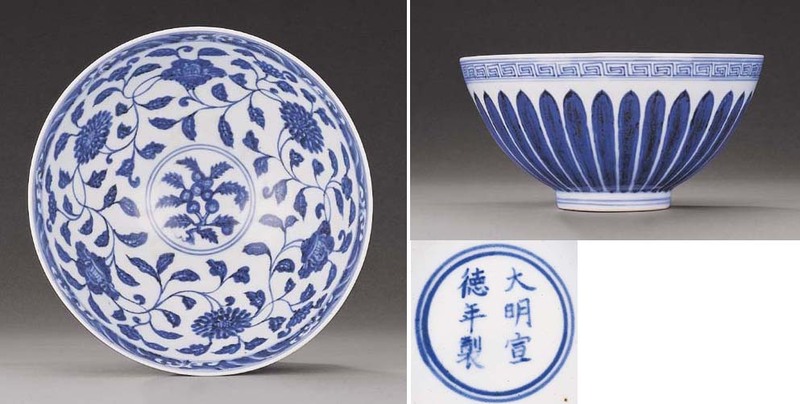 Compare also the Xuande-marked bowl in the present sale, lot 1513, which is decorated with the double row of petals on the exterior, and refer to the footnote for examples of this type. There are also a number of bowls of this design without reign marks, such as the one in the National Palace Museum, Taiwan, included in the Special Exhibition of Early Ming Porcelains, 1982, illustrated in the Catalogue, no. 23; one illustrated in Porcelains from the Tianjin Municipal Museum, 1993, pls. 76 and 77; one illustrated by J. A. Pope, Chinese Porcelains from the Ardebil Shrine, London, 1956, pl. 47 (top right), where two others are also mentioned; and another included in the exhibition, Beauty and Tranquility: The Eli Lilly Collection of Chinese Art, Indianapolis Museum of Art, 1983, Catalogue no. 91.